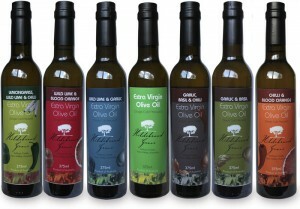 Products: Garlic & chilli fusions and olive oils. Arthurs Creek Garlic was established in 2010 as a cooperative venture for the purpose of growing quality Australian garlic and and producing premium garlic and chilli food products. Unlike some imported garlic, their garlic is not fumigated or bleached. Rather, it is nurtured through its growing period with tender loving care to ensure intense flavour and superb looking and tasting garlic. Their food products come from the same inspiration. They include: garlic & chilli fusion; garlic fusion; garlic & chilli extra virgin olive oil; garlic extra virgin olive oil; eggplant magic with garlic & chilli; and eggplant magic with garlic. The fusion is an old family recipe that has been passed down from generation to generation. 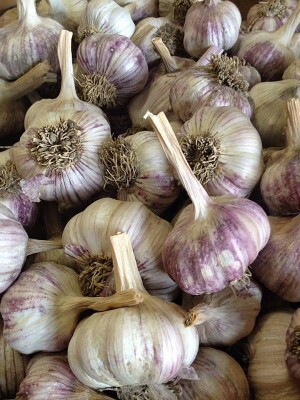 The garlic in all of their products is grown at their farm in Arthurs Creek. Because of their belief in using the finest ingredients, they only use Australian chilli and extra virgin olive oil in their products. Hildebrand Grove is a local, family-run olive grove in picturesque Cottles Bridge which has been quietly producing award-winning olive oil for ten years. Ann and David Strutt are in there at every stage of the process: tending the olive trees, harvesting and pressing the olives. The oil is produced from a blend of Corregiola and Frantoio olives and the end result – a flavoursome and award-winning extra virgin olive oil – has become a beloved staple in many local households. In addition to selling the plain extra virgin olive oil, Hildebrand Grove also produces a great range of infused oils. With a variety of tasty flavours, these are a sophisticated addition to any pantry and can be used in cooked dishes or to dress salads. 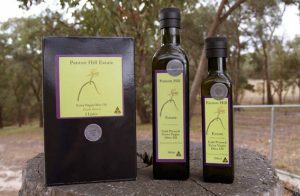 Panton Hill Estate Olives produces extra virgin olive oils, processed primarily as single variety oils, as well as selling table olives. It also makes a handmade range of cosmetic products, all made solely with their extra virgin olive oil, including soap, lip balm, hand scrub and calendula healing balm. The olive varieties include Frantoio, Correggiola and Koroneiki for oil production, and Kalamata and California Queen varieties for table olives. Quality is always the primary driver at each phase of the production process and the table olives are processed on site, using the traditional salt and water brine method of curing. This takes up to six months of careful attention to ensure the resulting table olives are firm and have the distinctive taste and qualities of their varieties. Part of the secret of the flavours are the shale soils found in Nillumbik, in which olive trees thrive.